This chapter reviews an information theoretic approach (Part V) to deriving quantum fluctuation theorems (see Chap. 10) that was developed in [37, 38]. When a thermal system is driven from equilibrium, random quantities of work are required or produced: the Crooks equality is a classical fluctuation theorem that quantifies the probabilities of these work fluctuations. The framework summarised here generalises the Crooks equality to the quantum regime by modeling not only the driven system but also the control system and energy supply that enables the system to be driven. As is reasonably common within the information theoretic approach but high unusual for fluctuation theorems, this framework explicitly accounts for the energy conservation using only time independent Hamiltonians. We focus on explicating a key result of : a Crooks-like equality for when the energy supply is allowed to exist in a superposition of energy eigenstates states. The author thanks Johan Åberg, Álvaro Alhambra, Janet Anders, Florian Mintert, Erick Hinds Mingo, Tom Hebdige and Jake Lishman for commenting on drafts and David Jennings for numerous indispensable discussions. 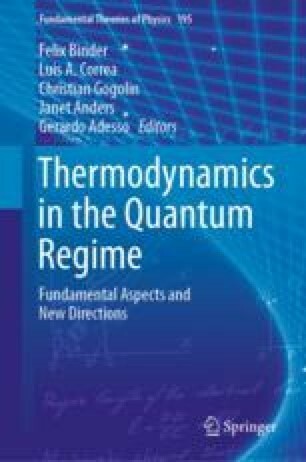 The author is supported by the Engineering and Physical Sciences Research Council Centre for Doctoral Training in Controlled Quantum Dynamics.